Single Float Level Transmitters suit shallow tank monitoring. As drop-in replacements using existing tank fittings, XM/XT Series provide continuous fluid level monitoring of tanks with depths <20 in. XM/XT-300 Series, constructed from all-wetted polysulfone plastic parts,Â is direct compatibility with various chemicals, while XM/XT 700 Series comes in stainless steel or brass. Both fluid level transmitters feature 0.14 in.Â resolution, indicating length to 14 in., andÂ stem length to 20 in. Custom mountings and float materials are available. Plainville, Connecticut, USA – Gems Sensors & Controls (Gems) (www.gemssensors.com), a leading industry supplier of liquid level, pressure and flow sensors, as well as fluid control devices, has announced the global market introduction of its XM/XT Series. The Gems XM/XT Series is a family of cost-effective, single float transmitters, expressly designed to provide high-accuracy continuous fluid level monitoring within smaller, more compact tank environments. Historically, off-highway vehicle, HVAC, locomotive, commercial printing, and medical OEMs have had limited capability for cost-effective and accurate fluid level monitoring of tank depths less than 20”(50.8 cm). Many OEMs would specify multi-level float solutions, despite their discrete point limits of indication, due to the lack of availability of a lower cost single float transmitter. The new Gems XM/XT Series effectively addresses these concerns. Gems XM/XT-300 Series fluid level transmitters are constructed from all-wetted polysulfone plastic parts. This ensures their direct compatibility with a variety of chemicals. Its counterpart, the Gems XM/XT 700 Series, combines the extended durability of stainless steel, or brass, within a lightweight package. Both models are designed to serve as effective drop-in replacements using existing tank fittings. They feature 0.14” (3.5 mm) resolution; an indicating length to 14 “(35.5 cm); and a stem length to 20” (50.8 cm). Compact and versatile, XM/XT Series units are also available with a broad choice of mountings and float materials to suit individual requirements. As a standard catalog product, Gems XM/XT Series models are available for immediate customer order. Full-scale OEM volume manufacturing can usually proceed in just a few business days. In addition, Gems engineers can design and manufacture a custom fluid tank level measurement solution to meet specific requirements. Custom fluid level transmitters can be produced in OEM volumes within shorter lead times than many other industry standard solutions. 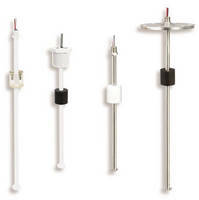 For more information about XM/XT Series single float fluid level transmitters or other liquid level sensors available from Gems Sensors & Controls, visit www.gemssensors.com/en/Products/Level.